When 15-year-old Dajerria Becton was invited to a pool party with her friends, she never expected her day to end with a run-in with the cops. 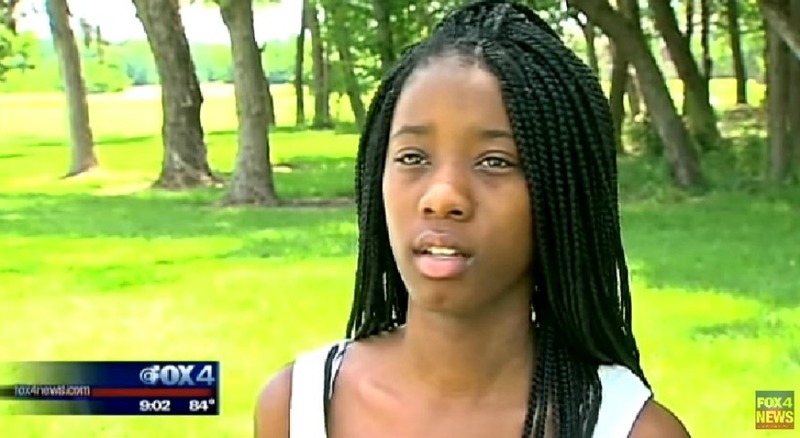 She and her friends didn’t even have anything to do with the argument that broke out at the pool — reportedly by a white mom yelling racial comments such as, “Go back to your plantation” and “Go back to your Section 8 housing” to a Black girl — but the police were called and when they arrived things went all the way left. As we all know, excessive force by police against Black girls and Black boys is happening all too often and we’ve got to shut it down. The scariest thing? This could have just as easily been you and your friends. 1) You could have been the one standing with your girlfriends discussing what just happened and wondering what to do next after exiting the pool area because a fight broke out. You’re not part of a “mob” as some people on social media liked to call it. You are just a part of a large group of Black teens who were at a pool party but had to leave all at once because of an incident started by someone else. Why does “large group of Black folks” have to equal “mob”? Also, it appears that the only teens targeted were Black teens. Why is that? Brandon Brooks, the 15-year-old white teen who filmed the whole incident was not made to sit down, was not handcuffed, and was not told to leave the area. “You can see in part of the video where [the cop] tells us to sit down, and he kind of like skips over me and tells my African-American friends to go sit down,” Brandon told NewsFix, a CW affiliate. 2) You could have been the one complying with the police officer’s orders to leave the scene, stopping for one second to turn to your friend and yell for her to call your mom. After being threatened with jail by the officer if they didn’t leave — “If y’all keep standing there running your mouths, you’re gonna go [to jail], too! Get outta here!” — Dajerria and her friends seem to be asking the officer if they can go get their stuff first, to which the cop answers that he doesn’t care that their stuff is still inside the pool area and that they need to leave immediately. Dajerria’s cell phone may have still been with her belongings, so she wouldn’t have been able to call her mom herself. 4) You could have been the one whose unarmed friends got a gun pulled on them because they saw you being hurt and came over to help. Because whose first instinct wouldn’t be to run to their friend’s aid, especially when their friend was being unfairly manhandled by a cop in a society that sees those situations turn deadly all the time? Even a couple of the other cops on the scene seemed to know that pulling a gun on unarmed teens was a bad idea and rushed to keep the offending officer from potentially doing more with that gun. 5) You could have been the one laying face-down on the grass wearing nothing but your bikini, as a police officer pinned you down with his knees — and for what reason, again?? In the video, you can hear Dajerria’s friends asking the cop why he’s treating her that way and you can hear Dajerria crying. Corporal Eric Casebolt, the cop who used excessive force with Dajerria and pulled the gun out on some other teens, resigned today, but that doesn’t mean we should fall silent. Share this post, tweet, and Instagram your thoughts about how the whole McKinney incident went down using the hashtag #WeAreDajerria. What do you think of the whole situation? How do you think you would have reacted if you were put in Dajerria’s position? Tell us in the comment below! ©Sesi Magazine, LLC, 2019 Unauthorized use and/or duplication of this material without express and written permission from Sesi Magazine, LLC is strictly prohibited. Excerpts and links may be used, provided that full and clear credit is given to Sesi magazine/sesimag.com with appropriate and specific direction to original content. Sesi participates in some affiliate marketing programs, and therefore, Sesi may receive a commission on some purchases made through links on our site. Powered by WordPress.com.